Home-brew way to get better internet when you live outside town. If you live in a rural area it is quite possible that you have a DSL internet connection that only gives about 3Mbps if you are lucky on a good day. The typical definition of broadband is a minimum of 5Mbps, and really it is good to have about 15Mbps so that eg Netflix works at a good resolution. Typically a cable company such as Comcast will provide decent internet inside city limits, but they are typically not willing to extend it to rural areas where the housing density is low. There are various possibilities for getting better rural broadband internet, but the solution is likely to be very dependent on your particular situation. What's described below are two schemes to get high bandwidth internet to a rural house (eg my house). 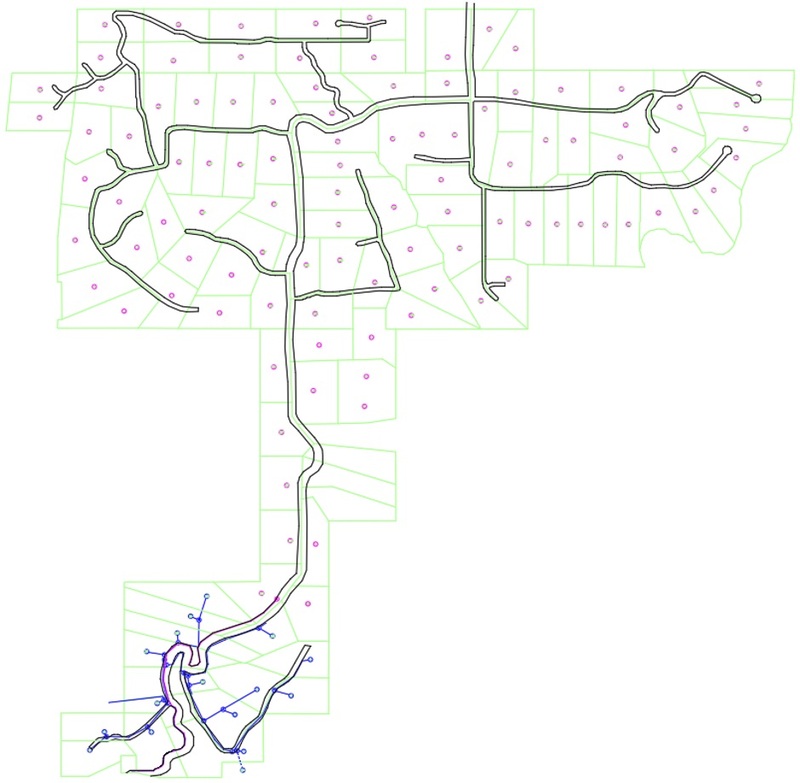 In my particular case there is a private home owner association road (with an easement) from the nearby town (eg Carnation, WA, USA) to my plot and other plots so the solutions are designed around that. Having good broadband has a positive effect on property values. Nobody wants to buy a home without good broadband. It is possible that grants are available to allow a community to establish its own broadband network. Two schemes are detailed. Which scheme to use depends on whether the internet backhaul company you connect to is willing to allow bandwidth resale or not. If they want a one-to-one billing relationship with each household then you need the Single Household solution. Every household has an independent setup including their own three quarter inch conduit and their own modem box. The only thing that is shared is the shallow ditch. Other households can add their own conduit to the ditch either when it is first dug or by scraping off the disturbed soil, adding their conduit, and pushing back the soil. 48V power for the modem box is fed from each individual household down two 12awg cooper wires that are with that household's twin fiber in their own conduit. There are no joint costs and no joint maintenance issues. It is clean from a legal perspective because it only uses the road easement, and so the plot can be sold with guaranteed high bandwidth internet. Each household has their own 1 foot square watertight modem box in the easement (near Entwistle Street), down in town. From there they have their own 3/4" conduit to their house. In rounded up numbers the cost is $400, plus another $600 for every 1000 feet along the road, plus that householder's own labor. For cases over 9 miles it may be necessary to use a higher power optical converter. It is better to use a higher power transmitter rather than using an active repeater (better performance and less maintenance worries). Even if it is decided to implement a Single Household solution, you should also make sure nothing stops it becoming a Multi-household PON network (see below) at some future time. 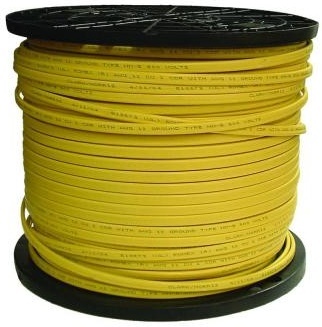 Dimensions: 3.7" x 2.9" x 1.1"
If one armored cable per household then it is about $150 per household per 1000 feet. SC 9/125 Fiber Optic connector assembly. 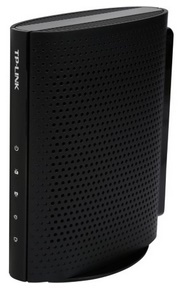 TP-LINK TC-7610 DOCSIS 3.0 Cable Modem Does 1Gbps ethernet (which means the better converter can be used). 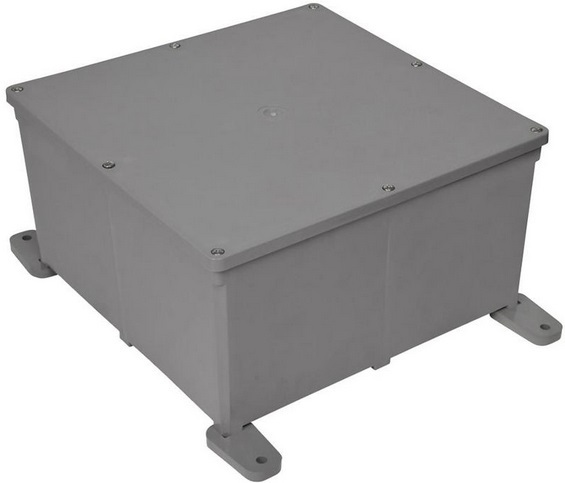 Dimensions: 5.6" x 4.5" x 2.3"
Per household waterproof box in easement. This avoids the box being big and visible in the easement. Each homeowner is responsible for their own internet connection with no need to involve other households. Modem is 5.6" x 4.5" x 2.3"
Optical converter is 3.7" x 2.9" x 1.1"
DC-DC converter is 3" x 3" x 1.5"
Could line the box with half inch polystyrene, but no need as the warmth from the electronics will prevent freezing and will allow it to cool better in the summer. Being below ground also helps. Could use a cooling inlet and exhaust vents to the modem box with a fan. The vents would have inverted Us to keep the rain out and flymesh. Could use recirculated airflow in a sealed metal box to get the heat to the metal of the box and then away to the earth. 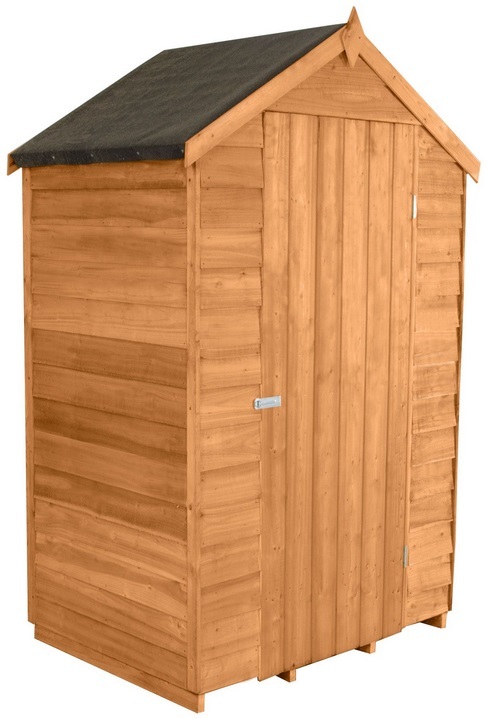 Ideally in the case of lots of households it's better to provide a small shed for any householder to use. 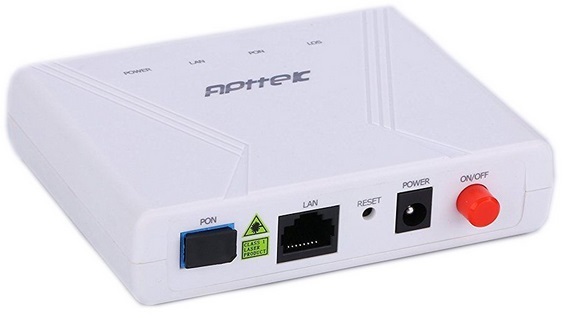 For modem and converter need about 2.5A at 12V. 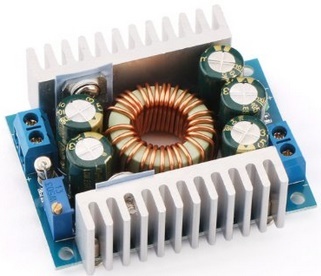 Also need a DC to DC converter to make 7.5V from 12V for optical converter unit. Also need a way to power cycle power to the modem. To avoid code hassles it is best to keep under 50VDC to count as low voltage. Use DC to DC converter to get 12VDC and then 7.5VDC. Use 20 amp 12awg wire with 48VDC. Need 12awg because of multiple 1000' sections. For eg 6000 feet the resistance is 9.6 ohms. At 1A this a volt drop of about 10V. Probably also need to allow for volt drop in the return earth wire, so might double volt drop to 20V. 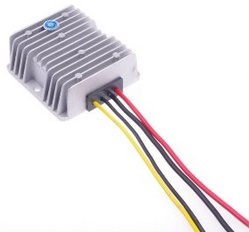 The 12V converter can handle a 28V voltage drop from 48V to 20V. 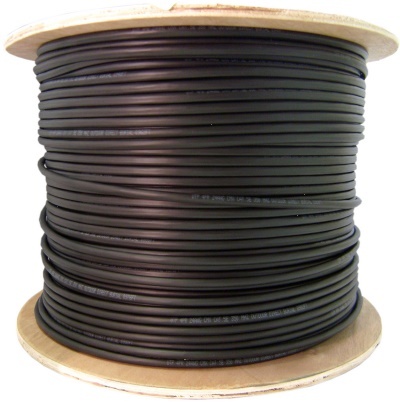 12awg romex is $285 per 1000', ie for eg 6000' it is $1,700. Using romex gives an earth wire to help mitigate volt drop in the return. For shorter distances you could reduce the cost by using 14awg romex. 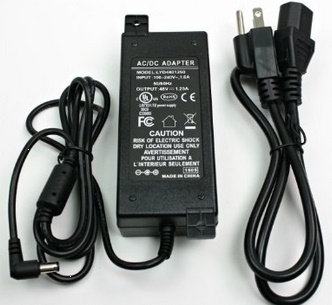 For longer runs a source power supply of 60V could be (unofficially) used (still can just about be called low voltage and the converter can handle up to 72 volts). In my case I would put the 48V power supply at my gate so that I have 115V power to my gate for a lamppost and the 48V distance is slightly shorter. Could use a 12 fiber cable as it is only $50 per household per 1000 feet, but that potentially introduces joint maintenance issues. There is a 24 fiber version, but it is hard to find at a good price. When the required optical cable lengths and number of fibers has been figured out then contact cablewholesale.com and get them to quote for the exact length you want. This "Gigabit Fiber To The Home" (FTTH) solution relies on being able to find an internet provider that is prepared to deliver a gigabit or more of backhaul bandwidth at the base of your private network with a contract agreement that allows the bandwidth to be shared, ie resold. The solution is optimized for providing high bandwidth internet to up to about 100 widely spaced rural houses. It uses a Ethernet Passive Optical Network (EPON) that uses passive optical fiber splitters to form a fiber tree. The fiber is installed in slit-ed 3/4" conduit laid in a shallow trench along the side of the roads. The process of installing the conduit and fiber is easier if the road system between the houses are private roads (with an easement) controlled by a neighborhood association. Digging the shallow roadside ditch is best done with a homemade Ditch Blaster . This provides the interface between the private fiber network and the backhaul provider. It is equipment installed in a small hut to keep out the weather. In addition to finding somewhere to put the hut, the biggest issue is providing 115V power to the hut. The cleanest way is to have its own connection to the power company with its own electricity meter. The hut could be placed on one of the homeowner properties. This is good in that 115VAC power is available, but it requires the backhaul provider's fiber needs to be passive optical extended to that property. The backhaul fiber can be extended by the homeowner rather than needing the backhaul provider to do it. For this scenario you need to be sure that the selected homeowner will not sell the property to someone that is not willing to continue the hosting of the base station. 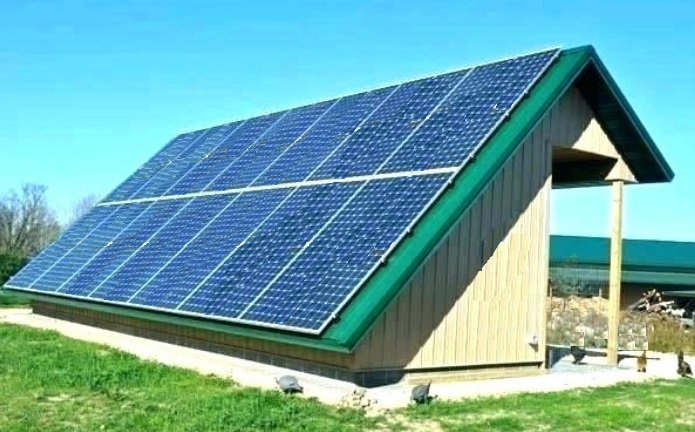 Another possibility is to power it using off-line solar use this needs a larger hut to provide more roof area. The hut could be in the road easement or it could be placed on a small piece of rented land, eg rented from the city. It needs to be a location that the power company is ok providing power to and is long term stable from a legal perspective. A covenant may be necessary. To help persuade the City, the hut can also be used as a kid's school bus shelter. Another sweetener is to provide free internet access (wireless) at the City's evacuation site (password protected with password given out on evacuation days and changed the day after). Having a Base Station hut under the control of the (Tolt Highlands) neighborhood association allows competition between backhaul providers which avoids being at the mercy of price hikes. The big benefit with a passive fiber network is that there is no electronics buried in the ground. It is possible to start with a 1GBit/sec network and later upgrade to 10GBit/sec without messing with the actual fiber in the ground (ie just upgrade the electronics in the hut and in the homes). The network is just intended for high bandwidth internet, ie phone and TV is not directly supported. Phone is best done with cellphones (and/or IP telephony, eg Skype), and TV is best streamed over the internet. A standard EPON can currently support speeds up to 1.25Gbit/sec (which is 1GBit/sec really as 25% is used for encoding). Advanced 10G-EPON technology provides speeds up to 10Gbit/second. A Passive Optical Network (PON) uses unpowered optical splitters which enables a single optical fiber to serve multiple premises. The single fiber is used bidirectionally by using two different light wavelengths (1490nm for transmitting to the homes and 1310nm for receiving packets back from the homes). Passive Optical Networks are typically limited to about 12 miles. EPON is a native Ethernet solution that leverages the features, compatibility, and performance of the Ethernet protocol. A point to multi-point network (P2MP) is created using a central optical line terminal and multiple optical splitters to provide service for up to 128 users (more usually 32 users). An Optical Network Unit (ONU) terminates the PON at a user’s location and communicates with an Optical Line Terminal (OLT). 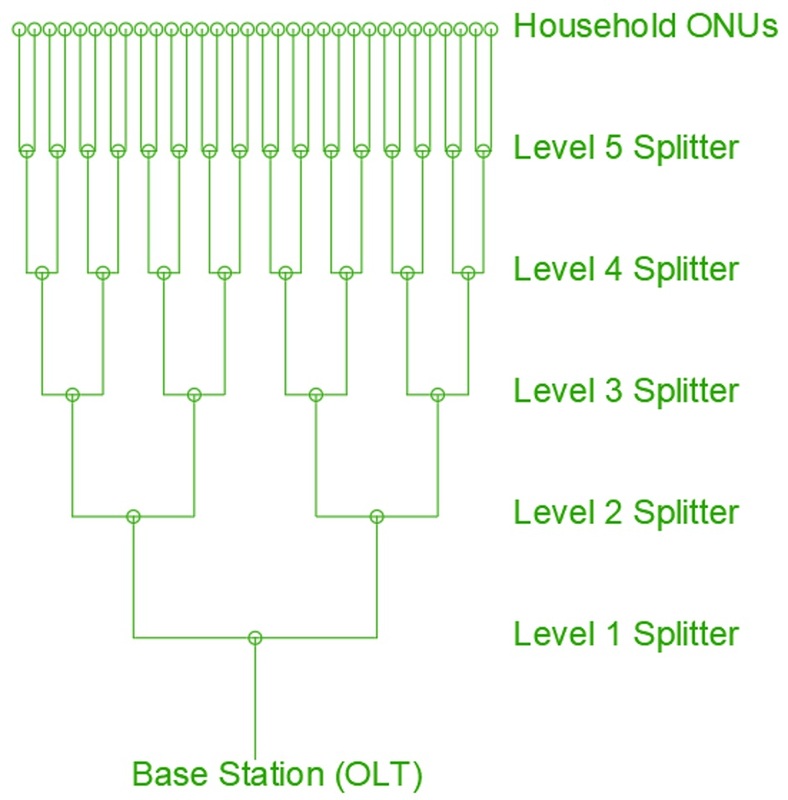 The term "ODN" just refers to the fiber network with its passive splitters. There are two types of EPON - symmetric and asymmetric. Symmetric EPON provides equal data rates in both upstream and downstream. 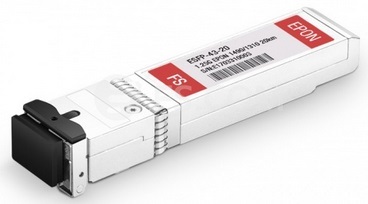 Asymmetric EPON provides higher downstream data rates than upstream. 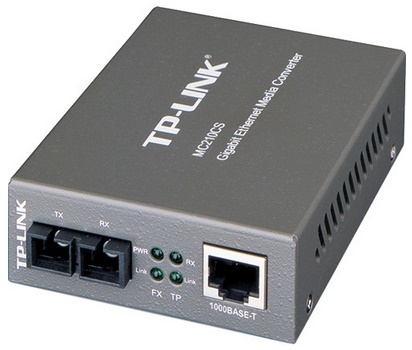 It can operate at eg 10Gbits/sec downstream and 1Gbit/sec upstream. In the future a PON network can be upgraded without any change to the installed fiber and splitters to eg NG-PON2 to give more bandwidth. The amount of light loss goes up with the split ratio of the splitter. 2 way is 3 to 4db. 4 way is 6 to 7db. 32 way is 17 to 18db. With a wide and even spacing between houses it is best to stick with 2 way splitters. Use a level one 2-way splitter as the trunk along the main road passes each group of houses. 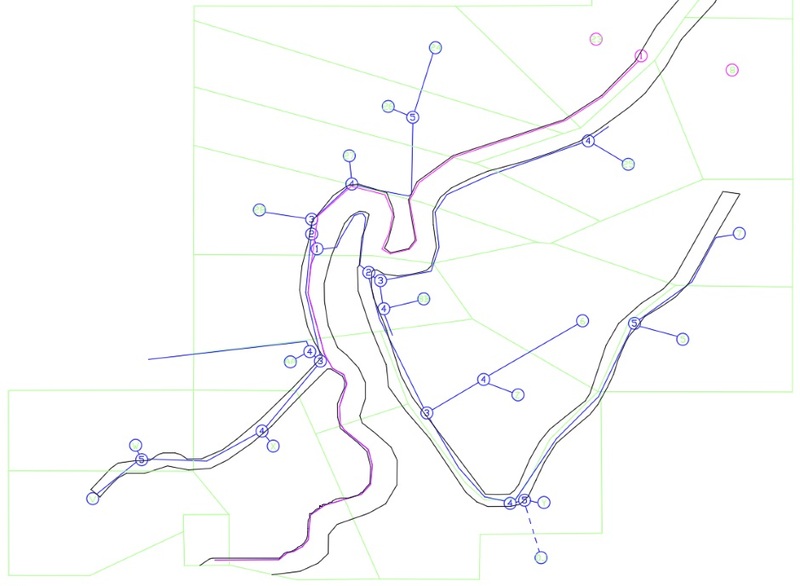 Then use more 2-way splitters within the group of houses (arranged to minimize fiber lengths). Each 2 way splitter gives 3 or 4 dB loss plus the loss (say 0.5dB each) due to the pigtail couplers. Say 5dB per splitter box. Relative to the splitter losses you can basically ignore the fiber loss (0.33dB per Kilometer). The maximum permissible optical power attenuation between OLT optical ports to ONT input when using Class B optical network elements is 28dB. If the launch power of the transmitter at 1310 nm is 4 dB loss with a detector sensitivity of 28 dB loss, the allowed loss budget is 24 dB. You can cope with something like 24dB of loss on each laser transmitter, ie each trunk. This equates to about five 2-way splitters in series. You need to draw the tree structure on a neighborhood map. You will need multiple laser powered trunks from the base station (OLT). Geographically you will typically only get say 15 houses per trunk rather than 32. If there are 90 households then that is 6 trunks from the OLT hut. On the diagram the numbers in the circles indicate the 2-way splitters and where they are in the hierarchy. Sometimes a secondary branch needs to backtrack a bit along the road. To allow better monitoring/maintenance/etc there is also a dedicated fiber from the base station hut to the nominated "control household". This allows the control household to check that the backhaul internet connection is working independent of the PON network. This will also be the fiber laid first in the conduit tray, with the PON fiber fitted later to the conduit tray. A household connected after a level 5 splitter will get just as much bandwidth as a household connected to a more direct level in the tree. The only advantage of being connected at a level closer to the truck (ie a smaller number splitter) is that it allows the household to install a further splitter to provide internet to two widely based sites on their property without needing an active repeater (not a big deal as utility power is available). Installing fiber is easiest when there is a private road system and there is an easement along the road system for utilities. An example easement might be 30 feet wide, ie 15 feet each side of the road center line. When installing fiber it is best to be as close as possible to the outer edge of the easement so that any future road work does not damage the fiber. It is important too that it does not interfere with road drainage. Drainage ditches get "dredged" to clear debris etc and you don't want this to hurt the fiber. Start by measuring 15' from the center of the road and marking a line at eg 14'6" for the shallow ditch that will take the tray conduit. Put the splitters in small plastic conduit boxes. Conduit with a 1/4" wide cut slot mechanically protects the fiber cable with the ability to retrofit cable fiber. It does not keep water out, but fiber is not harmed by water. Flashing tape can be used over the slot to keep mud, water, and debris out. The slot needs to be through the splitter boxes too. Cutting regular PVC electrical conduit is the least expensive way to implement what I call "tray conduit". You need to use optical couplers to connect to the pigtails from the splitter. You need one of these per trunk, (ie 6 of them in our case). Use a EPON Gigabit Ethernet switch in the base station (OLT) hut with fiber SFP adapters. This what each householder buys to go in their home. In the home also add a Router, a Gigabit Ethernet Switch, and a Wireless box. It is best if the householder buys their own ONU based on an Amazon link provided. As well as avoiding service provider electronic reliability issues, this allows users to opt for a more sophisticated ONU if they want, eg battery backed or with a router and/or wireless built in. It is also best if the householder actually plugs in the ONU to the bare fiber themselves in order to avoid building code permitting issues. Also the bare fiber should be installed to the outside of the house. The householder can drill their own hole in their house wall and poke an extension fiber through to their ONU box. An instruction document will be provided to the homeowner to give them step by step instructions. There needs to be an external fiber connector on the wall outside for testing purposes and that is also the contractual service delivery point. If the householder reports an issue with their service then the service operator can come to their property to test the raw fiber connection without needing access to the house. Ideally buy fiber in different lengths that already have SC-APC angle-polished connectors already fitted. Need to find a cable supplier than can economically provide custom cable lengths with connectors already fitted. At minimum, you should fit the connectors at home before going into the field. The SC connectors are small enough to fit down 3/4" electrical conduit, but this is not actually necessary when using slotted tray conduit. The single fibers typically need to be separately encapsulated because each will have a different length. But it may be possible to be more creative using plugs to connect to a smaller way cable to carry on from a splitter box. Consider using direct burial fiber to make them more robust in tray conduit or potentially even avoiding needing conduit at all (although this is not advised). It may be useful to have a pull loop on the end. Try to use 1/2" conduit as it's the least expensive. This can take about three fiber cables. Nearer the base station it is necessary to use larger diameter conduit. Conduit over 3/4" is expensive. Ideally want split conduit so it can be retrofitted to fiber. Think of it as a cable tray. You can use a table saw with a wide blade assembly to cut a 1/4" wide slot along the length. Flashing tape can be used on the cut slit to help keep the muck out, but the system relies on the fiber not being hurt by water. Ideally use red tape to make it as visible as possible. Split conduit can be installed before the fiber is fitted and even before the ditch is dug. Extra fiber can be fitted later. The fiber cable is something like 3/16" outside diameter, so the slot in the conduit needs to be 1/4". This can be done with a "Dado" wide blade. Conduit is expensive, especially if the diameter is bigger than 3/4". Because of this it is often better to use fiber cable with more fiber strands. Cables with more strands is not much bigger diameter. 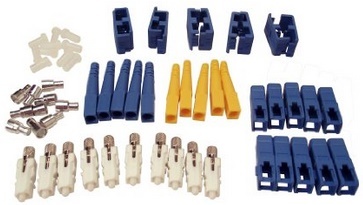 At the "number 1" splitter junction boxes a fiber to fiber plug coupler can be used to transition to a cable with less fibers. Need to be big enough to allow excess fiber length to be curled up inside. The part of the box under the removable lid (including the conduit connectors) needs to be cut with a slot.